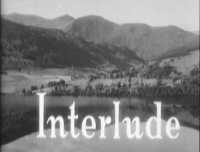 Consisting mainly of live broadcasts, timings were not always accurate in early 1950's BBC programmes, so interludes would be inserted between programmes to keep the audience amused. 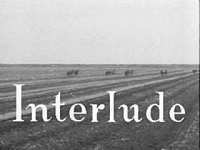 Typical interludes included: The Potter's Wheel, The Spinning Wheel, The White Kitten, Angel fish, Horses ploughing a field, and of course the classic "London to Brighton in 4 Minutes"
This longer interlude used trick photography to make, as David Lloyd James noted on the soundtrack, an average effective train speed of 765 miles per hour. 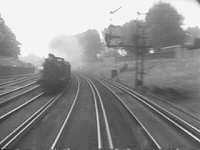 The cameraman sat in the front of the locomotive hand-cranking the 35mm camera at 2 frames per second (instead of 25fps). When he ran out of film and had to reload the 100ft. magazine, the sections of the journey missed during this procedure were covered by inserting a cutaway of the train driver at the controls. 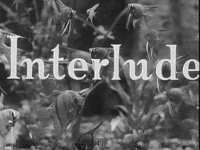 for YouTube video of the Interlude. 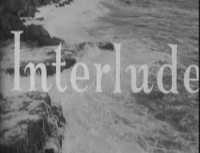 The background music for the interlude is 'Sabre Jet' by David Hart. Information about testcard music etc. can be found at The Testcard Circle website. 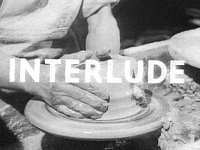 BBC: Sylvia Peters, Peter Haigh, MacDonald Hobley, Alex Macintosh, Mary Malcolm, Robert Dougall and Valerie Pitts. 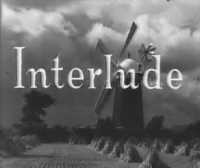 Sylvia Peters : Sylvia Peters A former musical actress, Peters joined the BBC in 1947 after answering a newspaper advertisement for a continuity announcer and was one of the post-War trio of announcers who stayed until 1958. She was also a presenter of BBC TV's Come Dancing in 1954 and between 1958 and 1958. 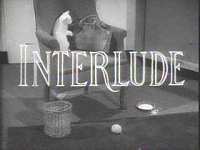 She also fronted BBC Children's TV's For Deaf Children in 1956. Retired and later ran a dress shop in Wimbledon but came out of retirement to work as a presenter on the Channel 4 series Years Ahead. She also re-appeared in November 1986 as an in-vision announcer on BBC Two to celebrate TV50, the 50th anniversary of BBC Television. One of her most notable achievements, however, was when she worked to coach HM The Queen in broadcasting skills to make the Queen's Christmas broadcasts. 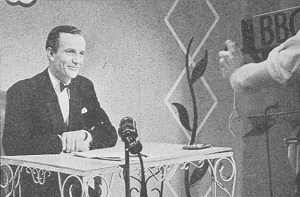 MacDonald Hobley : Macdonald Hobley One of the post-War trio of BBC TV in-vision announcers appearing from 1946 to 1956. Became one of Granada's first announcers and presenters. On its first night of broadcasting, Granada paid tribute to the BBC, and it is fitting that a well-known BBC announcer was with Granada for its opening celebrations. The occasion merited the front page of the TV Times. Hobley was a presenter of BBC TV's For Deaf Children between 1953 and 1955, and It's A Knockout in 1966. He re-appeared in November 1986 as an in-vision announcer on BBC Two, to celebrate TV50, the 50th anniversary of BBC Television. 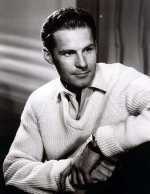 MacDonald Hobley died on 30 July 1987. 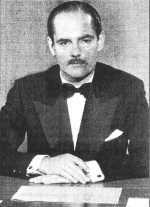 Alex Macintosh : BBC TV in-vision announcer from 1955 to 1961. He later contributed to many BBC programmes, including a spell as a regional presenter on 'Come Dancing' from 1957 to 1966 and between 1968 and 1972. 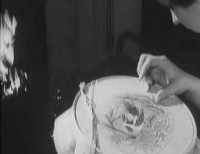 His voice was heard on the very first advert for Gibbs SR Toothpaste shown at 8.12pm on the opening night of ITV on September 22 1955. 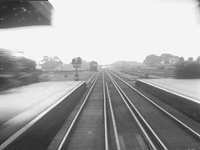 He presented the London area news magazine 'Town and Around' in 1961. He was a BBC TV relief newsreader in March 1961. Later he worked for an Australian TV company in Sydney and eventually retired to Norfolk and became a very good portrait painter. Mary Malcolm : Mary Malcolm BBC Radio Home Service/Third announcer in 1942 and 1957. 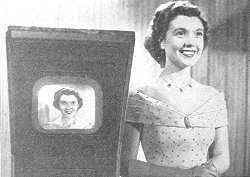 One of the post-War trio of BBC TV in-vision announcers appearing from 1947 to 1958. Presenter, BBC TV's Picture Parade in 1950. 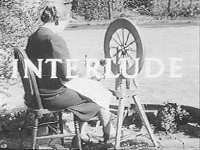 She also appeared on BBC Children's TV - she was commentator on the Children's Newsreel in the early 1950s and a presenter of Monday Magazine in 1955 and For Deaf Children in 1956. She returned to the BBC as an in-vision announcer in November 1986 to celebrate TV50, the 50th anniversary of BBC Television, on BBC Two. 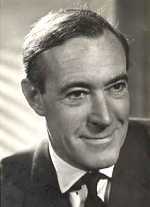 Peter Haigh : BBC TV in-vision announcer 1952 to 1962; Regional presenter of BBC TV's Come Dancing in 1960 and 1971. 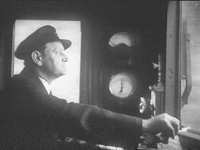 Presenter, BBC Light Programme from 1965 to 1967. 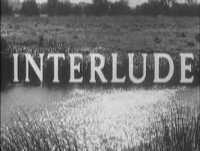 Re-appeared in November 1986 as an in-vision announcer on BBC Two, to celebrate TV50. Peter Haigh died in January 2001, aged 75. "You and your MacDonald Hobley! Are we eloping or are we not!?"